If stripping paint from wood is tedious, stripping it from a brick or stone fireplace can only be described as more tedious. When working outdoors, you can avoid the tedium of stripping by using a sandblaster, but that procedure is too invasive to use in your living room. Heat can also quickly remove paint from wood -- but not from stone. Alas, stripping is the best option, so get ready to make a mess. It takes time, but you can strip old paint from stone with soy-based stripper. Conventional paint strippers that contain methylene chloride aren't the best choice for removing paint from stone. Because stone has an irregular surface, you can't scrape off the paint softened by the stripper with a paint scraper. Instead, you have to scrub it, and you don't want to scrub a caustic chemical that can burn your skin and damage your eyes. While there is more than one alternative caustic strippers, one of the safest and most effective is to use a soy-based product. You'll need a little patience, but in return, you won't have to worry about getting skin burns or breathing noxious fumes. Because there is no way to avoid making a mess, it's important to cover the floor and the surrounding walls with plastic sheeting. It's best to tape the sheeting down with masking tape. You're now ready to apply a 1/8-inch or thicker layer of the stripper with a old paintbrush. Don't worry about overdoing it -- you can't. Even though the product is safer than methylene chloride, you still need rubber gloves, a respirator and plenty of ventilation. When the application is done, cover the stripper with a layer of clear plastic to keep it from drying out while it's working. Although the manufacturer of one soy gel product claims that paint is ready to strip 45 minutes after applying the stripper, it could take several hours for paint to be soft enough to remove from stone. Use a stiff-bristle scrub brush to remove the paint and stripper; the stripper is water-soluble, so you can keep the scrub brush clean by immersing it in a bucket of water. Although soy gel encapsulates lead-based paint and makes it safe to remove, but stripper residue containing lead-based paint is hazardous. If you suspect the paint is pre-1979 and thus may contain lead, you should hire a professional to strip it. It may take more than one application of stripper to remove all the paint, and when the job is done, a thin, milky residue will remain. You may be able to wash much of this away with clear water, but if not, you can buy a cleaning product from the same manufacturer that makes the soy gel. Instead of going to that expense, though, try white vinegar. When it isn't seasoning salads and french fries, this all-purpose condiment can handle a variety of cleaning tasks by virtue of the acetic acid it contains. 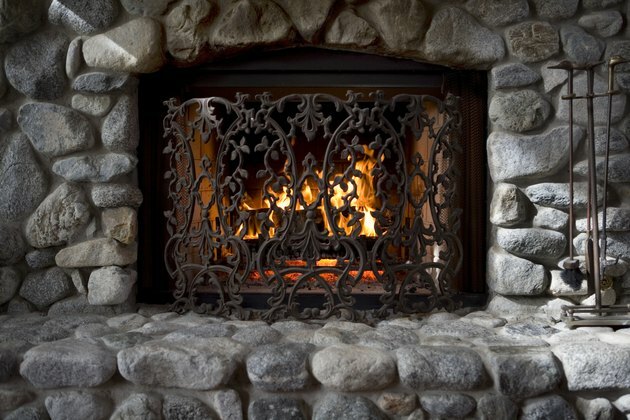 Not only can it remove the milky residue, but it can etch and brighten the stones of your newly stripped fireplace.